The school offers hourly lessons in Piano and Voice. The lessons cover varied aspects of the chosen discipline––be it Piano or Voice. Everything that makes up for a well-rounded musician is taught within the framework of the lesson. Therefore, the lessons include Musicianship, Music Theory, Ear Training, Sight-reading and Repertoire. Additionally, Solfegge is taught to all Voice students. In both disciplines, the student is taught all the musical terms and signs––usually in Italian, English or German– that allows him or her to understand and apply the nuances of feeling and expression in music literature. In Voice, the student is taught how to sing in different languages generally used in classical Vocal Literature––like Italian, French, German, Spanish, Latin and English. However, the student´s repertoire is not limited to these languages. 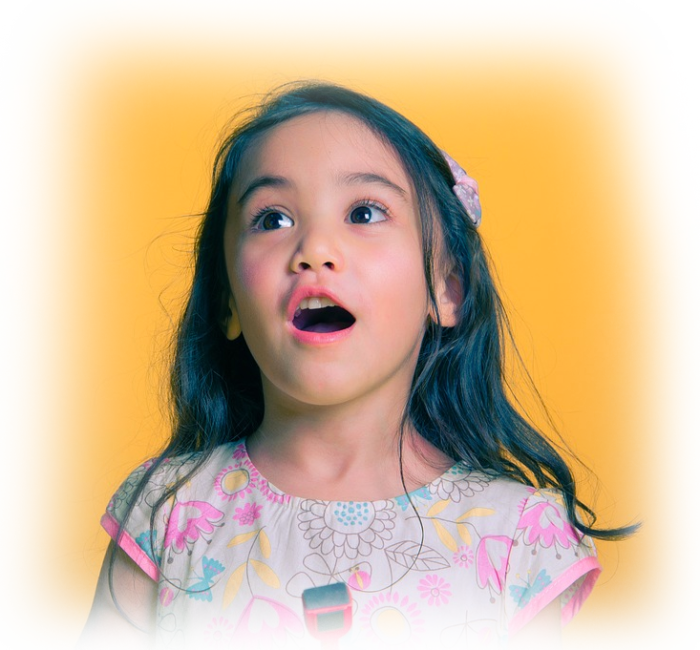 It can branch out to other languages like Filipino ( including its various dialects like Tagalog, Bicol, Visayan and Ilocano), as well as whatever native language the student wants to sing in. Our Vocal training is based on the study of “bel canto,” meaning “beautiful singing,” specializing on the smoothness, fluidity and beauty of the tone. To achieve this goal, we put great emphasis on vocal placement, production, projection and diaphragmatic control. Artistry and uniqueness are encouraged within the boundaries of correct vocal placement and the style of music involved. 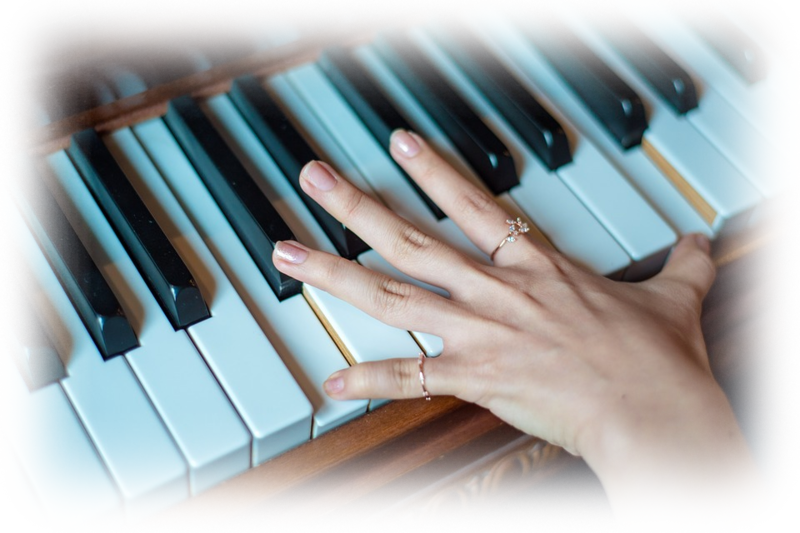 In the study of Piano, correct hand position and posture are basic in laying a solid foundation for developing the skills necessary to achieve excellence in piano performance. Technique is vital for finger dexterity requisite to the fluid execution of difficult passages and the ability to take full command of the keyboard. Artistry is encouraged and nurtured, for without it, performance becomes a barren, mechanical exercise. Sensitive to the convenience of the students and their parents, lessons are arranged by purchasing blocks of weekly time slots. Therefore, strict observance of the pre-arranged time slots is required, within reason, to maintain regularity and proper management of students’ schedules. It is, therefore, mandatory for the student to notify the school of any changes in schedule, 24 hours prior to the scheduled lesson time to qualify for a make-up. Missed time slots have to be paid in full to discourage frequent occurrences and to avoid inconveniencing other students who may be asked to swap their lesson time to accommodate a make-up. A missed time slot has to be paid in full although the school endeavors to offer a make-up for each missed lesson within the constraints of availability of slots and the frequency of occurrence. In the event that, for various reasons, the school is unable to meet the student on the pre-arranged time, the student is assured of a make-up and, if the student chooses not to do a make-up, he or she will not be charged for the missed lesson time slot. Make-ups will be scheduled within four weeks of the missed lesson. Fees are to be paid at least two weeks in advance. Group or family rates can be arranged. 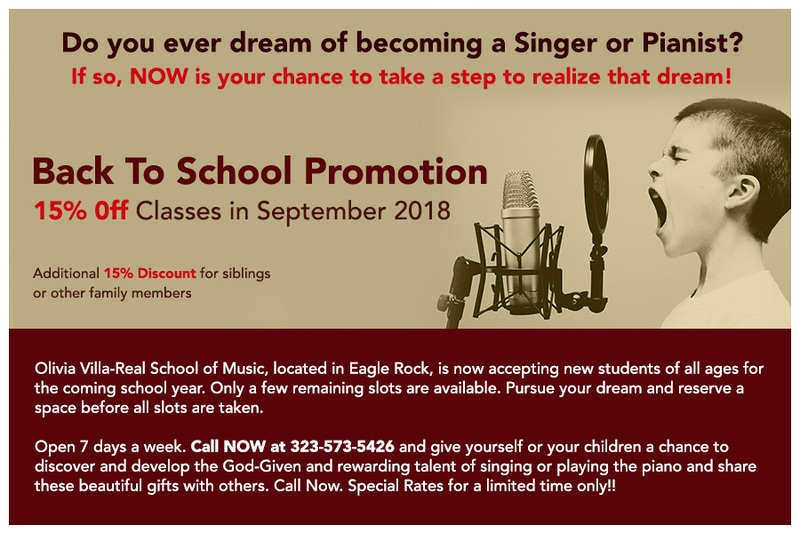 We also give discounts to students who are enrolled in both disciplines––Piano and Voice. We encourage a full hour of lesson each week because the first half hour is allocated to vocal technique which includes vocalization––vocal production, vocal placement––and diaphragmatic control which is responsible for managing correct breathing and phrasing. The remaining half hour is dedicated to repertoire studies and method books and other necessary explanations. To ensure effective and systematic learning, we recommend a full hour of lesson every week. We cover so many books––Method books, Technique Development, Sight-reading, Ear Training, Theory and Repertoire––and the full hour is barely enough to cover the materials, not considering how well-prepared the student is for the lesson and the time he or she needs to get warmed up and concentrate on the lesson. Little children take a little more time to get warmed up and tune in to the lesson and if the lesson period is only for half an hour, by the time he or she is ready to absorb the material being learned, it would almost be time to leave. If this happens every time, learning will not be as effective and the student’s progress is stunted. As far as attention span is concerned, an effective teacher implements a variety of ways to address this issue, and this has never been a problem for us. Singing or playing the piano before the teacher or before one or two people is very different from performing before a bigger crowd. Some people shy away from such performances because of stage fright. In our effort to reduce or eliminate this fear, one of our major activities is a yearly recital whereby students have the opportunity to perform before a bigger crowd besides his or her teacher, parents, family and friends. The recital includes solo performances as well as ensemble work like duet, trio, quartet, quintet or chorus. Recitals are generally held at the school or at a hall or church. The school is run by Olivia Villa-Real who belongs to the Glendale Branch of the Music Teachers Association of California (MTAC). MTAC offers the Certificate of Merit Program, which enables teachers to have their students participate in a yearly testing. The testing covers five important facets of Music studies–– Theory, Sight Reading, Ear Training, Technique and Repertoire. Students who excel in the varied aspects of these exams are recognized and given awards to encourage them to do well in their chosen discipline. Furthermore, they are given a lot of performance opportunities. Olivia Villa-Real also belongs to the National Guild Of Piano Teachers as well as the Associated Board of the Royal Schools of Music which have their own respective programs and examinations..
We endeavor to give a first-rate quality of learning, instilling theoretical and practical knowledge to our students to make sure that they are equipped with all the tools necessary to perform as a well-rounded musician. Aside from the dry technical know-how, however, we nurture artistry, allowing students to express themselves within the boundaries of correct technique. Music is an art. Although, first and foremost, it is important to have a foundation rooted in correct technique, we are aware that, as a developing artist, the student should be allowed to soar into the unlimited horizon of his imagination and artistry. Our school is a nurturing learning environment. We are here to teach and develop, not robots, but musical artists, with particular sensitivities and imagination that know no bounds. We are very aware of the heavy responsibility we have in either making or breaking a prospective talent. We have heard so many stories in the past about talented musicians who either got discouraged or dissuaded from developing their craft, thereby, failing to reach their maximum potential because of a bad earlier musical learning experience. What a waste of talent and gift from God just because of a bad beginning! Aware of this responsibility, we are committed to our policy of discipline with loving guidance. Students grow with us and develop a special bond with us. As we hone their craft either as a singer or as a pianist within this loving atmosphere, they are able to express themselves in the music that they play or sing. This freedom provides a fertile ground for creativity. Creative art cannot be forced nor inhibited; it is spontaneous and free. Please call (323) 573–5426 or (323)254-3060 for details and to make arrangements. Rates vary depending on type, size, location and length of event, as well as microphone or other audio system requirements. Visit our photo gallery for some of Olivia’s performance photos!